Here is the third snippet of The Colchis Job, coming on August 3rd to Amazon. 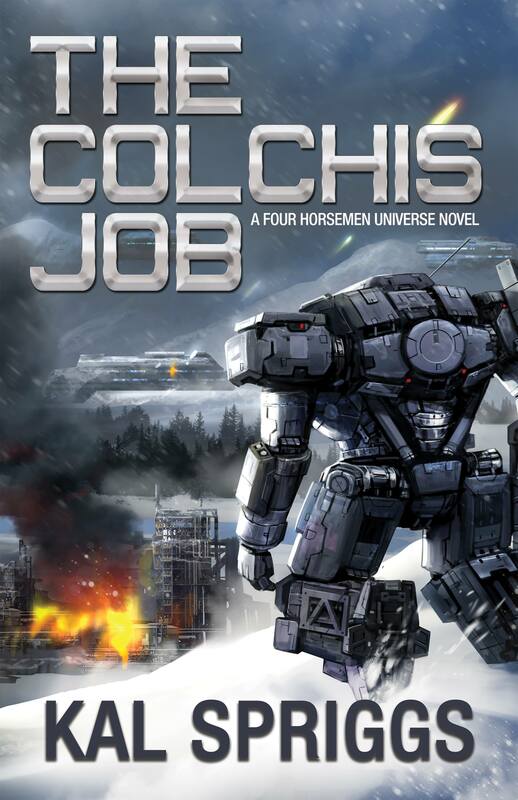 The Colchis Job is a military science fiction novel, set in Mark Wandrey’s and Chris Kennedy’s Four Horsemen Universe. For snippet one, go here: (Link) and snippet two go here (link). “Sir,” Grimes called as I came down the corridor, heading to my quarters. I’d just confirmed with Reedie that Ruel had taken his radio away when he’d been trying to report up during the gunfight with the pirates near the armory. I wasn’t too happy about that, but I hoped that I’d settled things with the display on the bridge. “Private Mulcahy wanted a word with you.” The tall, brown haired young man had an earnest expression on his face. Then again, Grimes always looked earnest. I almost wished I had a face like that, people would have believed any lie I told them. I looked at the private behind him. Mulcahy was one of the surviving CASPer pilots, if I remembered right, and shown some good promise. I planned to keep him on. He was a tall, lanky redhead, who normally kept his mouth shut and did as he was told. Even better, he’d fought like a demon back on Bedarine Seven. “What’s up?” I asked. “What is this about?” I demanded and my hand fell to my slung MAC. “Oh,” my hand flexed against my weapon, “is that all?” I asked, not particularly concerned. They’d been caught in the act of piracy. Most mercenaries wouldn’t even give them a trial, they’d be vented out an airlock before lunchtime to not ruin the rest of the day. Some mercs I’d dealt with would sell them into indentured work on one of the frontier mining worlds. A Peacemaker might care, but only if Ruel had gotten creative in his killing of them. Pirates were scum, worse than scum, for they clogged up the traffic between star systems, the very lifeblood of the Galactic Union. “Huh,” I said. Ruel had been the one to suggest coming here to Anauros to sell some of the equipment. What if that was his plan, from the beginning? Get us here, have his pirate buddies kill me, take the ship, and then sell the equipment for himself or just keep a nice cut… The system did have something of a rough reputation, the locals probably wouldn’t even care, especially if he sold all of our gear here. “That’s it?” Mulcahy seemed outraged, “That’s all you’re going to do?” His freckled face grew flushed and his eyes bulged in anger. Behind him, Grimes reached forward and caught his shoulder, restraining him. “Sir?” Grimes licked his lips nervously. All this intrigue and backstabbing was out of his league. Still, at least I knew I could trust him to do as he was told. “Ruel might try to seize the ship. I don’t want anyone from his platoon in position to do it. Brief Reedie and… hmm I think Miss Valsaint, tell them the threat. One of you is to be on each shift until we make it to Karma.” That should keep Ruel from being able to stage mutiny.